While reading today’s Daily Lex installment for March 26th, I found myself nodding in agreement. About the strapping on the equipment and feeling one with the air part. Oh yeah, the flying part for me is sans the aircraft. At least the relevant part is. While it does begin in an aircraft, he first part is really kinda like an elevator with a really touchy attendant or two. You get on with your bags and equipment, everyone stuffed inside, then it lurches up with the occasional jolt and bump. Finally you get to the floor you want, maybe 24,000′ or so, the attendant opens the door for you, announces your destination, and we step out. And sometimes it’s only 1,200′ or so. And sometimes the attendants have a good reason to be proud of their ability to get you to your floor as some of the folks still on the ground floor are the envious types and consumed with their envy. Cursing, gnashing their teeth, and throwing things up at your elevator car of woe and delivery. And the elevator attendants have need of things like spoofing gear, chaff, and other things not usually found on the elevator you ride in Macy’s. So it gives the attendants something to talk about later on that night while they’re back in the club. But I digress. It took you a couple of hours of pre-breathing pure oxygen to purge your system of nitrogen before they depressurize the aircraft to the 24,000′ altitude that you’re at and open the back of the plane. The crew lowers the ramp at the rear of the plane (or jet, I’ll use generic “plane” here as it’s my story) when we are getting close to the drop zone, or target. It’s a drop zone if folks you want to see are waiting there and have lit a fire, an IR light, or put out bright color panels. If there’s no one there, or possibly folks you’d rather not make the acquaintance of just yet, then it’s a target. In cases like this, it’s probably dark out, both in the air and on the ground. The jumpmaster crouches down to look forward of the plane the better to see where our target is and where our drop point is. Inside, we’re getting ready, disconnecting from the oxygen console we’ve been hooked to for the last few hours. Checking the equipment attached to us, 100lbs or so of rucksack with goodies for the mission, weapons, small oxygen bottles for breathing from now to the ground, and ensuring that everyone’s altimeter is reading correctly. 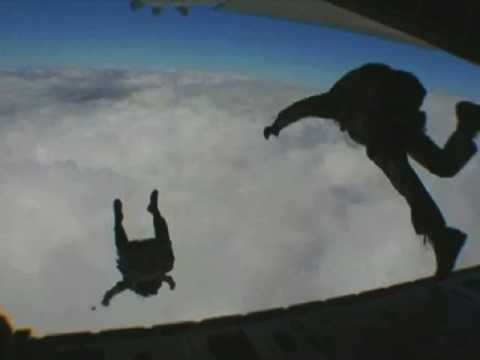 The jumpmaster will wave everyone up to the edge of the ramp to stand by for the jump. The ramp is about fifteen by fifteen feet or so and about 12 inches thick. So, you’re standing on the tailgate of a plane looking out over 24,000′ of pretty much dark nothingness over a place you may not ever have been to before. With about 10 or so other guys all around, you stand on the edge of the world until the light turns green and the jumpmaster waves everyone out. In a matter of seconds about 5,500 pounds of specialized humanity dives out of the back of the plane, into its jet stream, and into the darkness beyond. Everyone flies a loose formation through the sky on the way down. Through the dark at about 126 mph with just some dim chemlites to see each other. Think very dim running lights for those of you who are compulsive plane riding types. One man, the base man, tracks to the opening point and everyone else follows him. Glancing at the dimly lit altimeter on your wrist until the signal is given to turn outwards and spread out before opening. The ram-air canopies ripple open in the dark until all are open and the formation rebuilds on the base man again for the approach and landing. The parachutes have forward thrust, can be steered, and stalled similar to other unpowered aircraft. The base man heads down toward the landing point flying the approach: downwind, crosswind, and turn onto final. That 100 pound rucksack we mentioned earlier? It’s attached to you with a 30′ line to an anchor point on your harness. On your way down your hook your legs into it, then release it from it’s attachment straps letting it dangle from the toes of your boots as you enter the pattern to land. After you turn onto final, as you approach the landing zone, you release the brakes on the ‘chute to gather speed. If it’s a full moon, you can do the landing by sight, let the rucksack slip from your boots to dangle below you just as you flare the ‘chute for contact and stall, gently contacting the ground. If it’s too dark, the rucksack dangling below you acts as a feeler gauge to warn you that you’re within 30’ of the ground. When you feel it hit the ground, apply brakes and prepare to do a parachute landing fall when you hit. On the ground you can hear yourself breathing until you drop one side of the oxygen mask. What a rush. You think back to that moment standing on the ramp between the green light going on and stepping off the ramp and think, “And they pay me to do this”. And nothing in civilian skydiving is like this. You can’t even pay to do it now. No, you never get used to not being able to do it anymore. Never.